How to make rice cakes (not the Quaker ones…) | eat. live. travel. write. 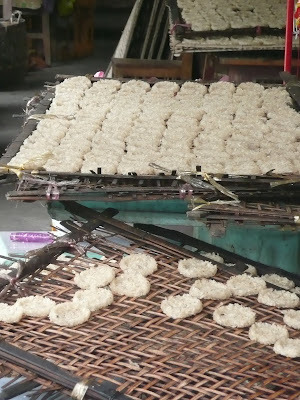 Ok, I have to admit I am not a big fan of processed rice cakes so when we had the opportunity to see the real thing being made in Laos this summer, we were very excited. I am not sure what happens in the Quaker factory but the ones you buy taste so… well… artificial. I mean – check out these flavours – Cracker Jack butter toffee???? For goodness sakes!!! Neil hates them (I went through a brief phase of having them in the house) so he was a bit skeptical to try the Lao ones. He loved them. Really a fascinating post accompanied by great photos! I would love to have tasted those! These look amazing. I have a question, though: the 'after' photo looks like the rice is puffed, but in the 'before' photo it looks like it's steamed. Does it dry that way? Lucky you to get to see this! Kate – the rice is steamed and then – yes they were baked (toasted). I just edited the post to reflect that step too! Sorry! Oh dear… yet another thing that's infinitely better when you make it yourself yet I can't be arsed to do it. WOW, what a fun experience! Those look great! Very interesting post. Therefore the real cakes have no binding agent, no colourings, no preserving agents… just plain rice. Miriam – yup, sticky rice does the trick apparently! Um, wow! This is so awesome. I'm plagued by never being able to get sticky rice right–looks like a necessity here, huh? Your photos, as usual, are lovely. I love the very first photo, of those rice steamers. That is one shot that clearly establishes you are far from home. I'm also in Neil's camp regarding the styrofoam rice cakes they sell in supermarket. What a phony food. Def. somehing I'll only eat when dieting and I want VOLUME. I have never contemplated making my own rice cakes since the store bought are so unappetizing. This makes them seem much more appealing and attainable. Cool post. Good to know how it is done. I am certain I would like the authentic variety. Kablooey – there was nothing styrofoam like about these ones, that's for sure. Lori – yes it was great to watch it up close. Chow – thanks! The lady didn't look like she was having too much fun, you're right. I can imagine that doing that all day would be extremely tedious, not to mention HOT! I love the steamers in the beginning and how all the rice patties are lined up. It must be great fun visitng this place and learning about the process. They do look like the Quaker rice cakes but the real ones. They look gorgeous when they're lined up. Now, I know how they're made. Penny – the steamers are lovely, yes! Divina – yes, they look like the original rice cakes before we started flavouring them beyond recognition! Wow! That's really cool. I just love all of your photos from that trip! Traveleatlove – thanks! I enjoyed taking them! Wow, talk about diy. It seems too easy not to try it. Duo – it really does seem so simple…. Mardi is right n- these ones were actually edible. Tasty, even. Neil – well there's a turnup for the books! how cool to see how they're made! and these do look tasty – no comparison with those awful quaker ones in the stores. Do you know how long and at what temp. they are baked for? If you are not using a conventional oven, so what type of oven are you using? Can you be specific? I just ended up here because my daughter wanted to know how rice cakes are made… Very cool — we are going to try next week. 4) have you added any flavors and if so, what & how do you make them flavored? I don’t actually have a recipe, sorry! 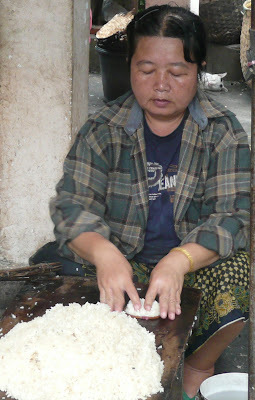 I merely wanted to show how they make rice cakes in Laos! Thanks for sharing this, I’m going to give it a try! I don’t like the taste of storebought ricecakes and if I can make it from scratch, I’m thinking it will be healthier. Found you through pinterest. Lovely article. Reminds me of Korean nurungji.. Korean scorched rice. When we make rice in the rice cooker, or if you make rice in a pot on the stove and the bottom gets a little scorched we eat the soft rice off the top and save the bottom scorched rice, scrape all the soft rice off of it, pry it off the bottom of the pot then fry in some hot oil on the stove top to make crispy. You can sprinkle with salt or sugar if you like or eat it plain like crackers. Oh I love the sound of that too!